I can't tell you how much I love a good burger and fries. It's my ultimate favorite "unhealthy" food and something I would undoubtedly include in my last meal list if I had the option. So you can imagine just how excited I was to see a new burger joint opening up in my neighborhood but I was stunned when I saw its name. This was not only a blatant rip-off in name but concept as well of my beloved Father's Office (F.O.) in LA. Actually, my initial reaction was probably along the lines of how I reacted in the first grade when my friend's older brother in the fifth grade uttered the word "crap"- an audible gasp, bugged eyes and backing away slowly by me, half expecting lightning from the heavens to strike down. As other zealous burger fanatics would agree, it's borderline blasphemy for a joint to take away the name and concept of such a famed place. But as I continued to pass by the new place in the days leading to its opening, my curiosity heightened to levels of anticipation I hadn't felt before in a while. I mean, this new place had to have balls to lift the name off of F.O. and it almost felt like the joint was taunting me- "Yeah, that's right. MOTHER'S Office. You have a problem with the name? Why don't you come in and tell it to our face?" Finally while out and about recently with a friend, we noticed the place had opened and decided to pop on in for a try and see how just how this audacious place fared. Apologies in advance for the lower quality pictures as I didn't have my camera on me and had to use my phone. The interior has a similar laid back vibe to F.O. with slightly dimmed lighting, a sleek, slightly antique-like gastropub look and feel. It was definitely modeled after F.O. but I have to say, it was nicely yet simply done and made me feel for a moment like I was back in the States. It's simple enough but little attention to details, such as the large antique mirror seen upon entering or the unique lights, gave it an upscale but unpretentious feeling. The menu is extensive and has some creative burgers like a gorgonzola cheese and apple burger, a rich cheese burger (with mozzarella, emmental, mascarpone, cheddar and more), the mamma mia (with bolognese sauce, pancetta, cheddar, etc) and a few other burgers on the menu.The simplest burger (Mother's burger) is the cheapest at 9,000 won while the Mamma Mia comes out the most at 14,000 won. Some of the menu items are obviously lifted from F.O. 's menu including the sweet potato fries and a duck, figs, mustard, etc burger which is almost exactly like the liberty duck confit salad served by F.O. Also on the menu are other pub foods such as fish sticks (12,000), beef chili nachos (13,000), anchovy penne (15,000) and a few salads (these looked pretty good too). The drinks menu is above average for a place in Korea with three kinds of beers on draft, including their own Father's IPA (7,000 won) and bottled beers and cocktails/shots. Cocktails includes Korean faves like mojito (9,000), agwa bomb (8,000), jager bomb (7,000) and more. I didn't sample any of the drinks this time around but I'm especially intrigued to try out their Father's IPA next time. For ordering, we went with a standard Mother's Office to see how their most basic burger was like but had trouble deciding on what other burger to try. I was going to go with the rich cheese burger but the waiter said the "souvenirs de paris" burger, which seemed rather eccentric in its description with ingredients like french blue cheese, blueberry and heavy cream was the popular option there. I was skeptic but seeing as how the waiter recommended it, I took his word and went with it. We also put in an order for sweet potato fries (5,000 won) to split. We were only one of two tables during our meal and the food took some good time to prepare. 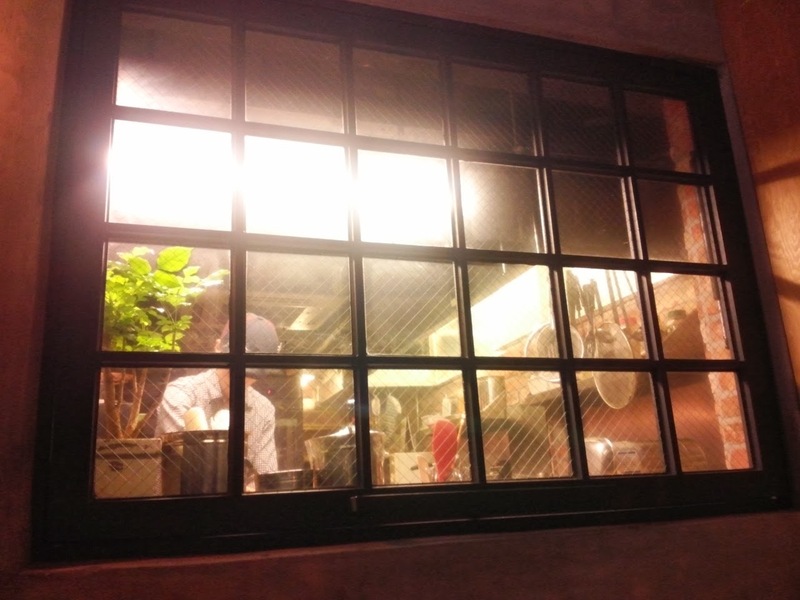 We were seated by the little window to the kitchen and could see that they made our food to order and watched the cooks carefully molding out our beef patties and cutting up the sweet potatoes. It must have taken a good 8-10 minutes for our first dish to come out which in our case was the sweet potato fries. The fries were very hot from their oil baths and intriguingly came dusted in powdered sugar and a bit of cinnamon. Sour cream was provided on the side for dipping. The sweet potato fries were decent but it's hard to go wrong with nearly anything deep fried in oil, isn't it? F.O. 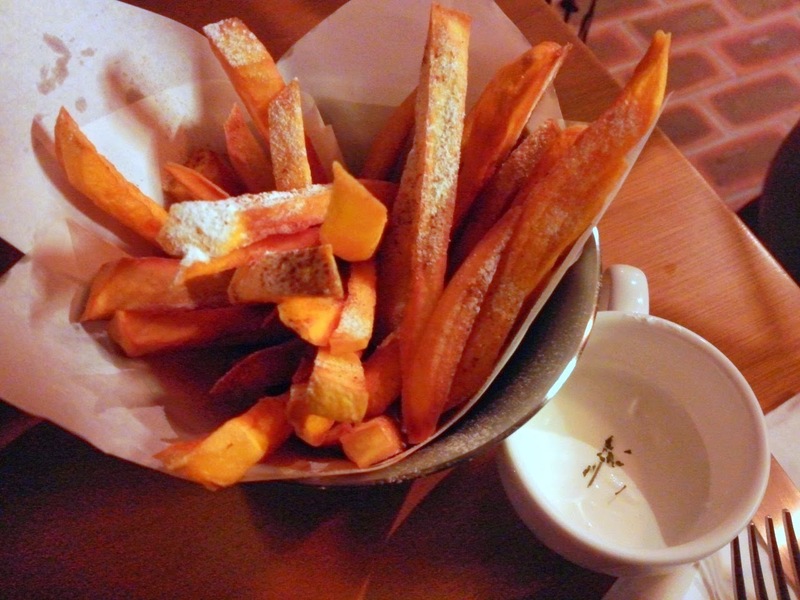 's sweet potato fries includes little extras like roasted garlic and blue cheese aioli but M.O. 's was rather uninspired and overpriced at 5,000 won. The sour cream for dipping was ok but by the time the ketchup came, the sour cream was pretty much ignored. Moreover, the sweet potato fries were slightly overcooked, making it a bit dry. Cooked slightly less and a little something for oomph, either on the fries itself or a stepped up dipping sauce is needed for this menu item. Otherwise, this is a dish you can make (and perhaps do so even better) at home. Skip it. 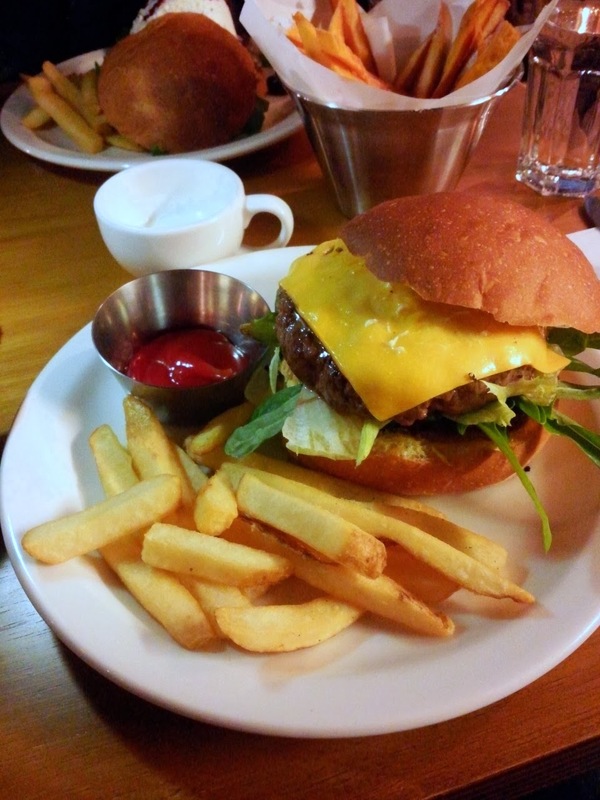 Our burgers arrived on plates, each with a small handful of fries and a bit of ketchup on the side. The fries weren't shoestring style like F.O. 's but thicker "chips" and came hot from cooking. It's not a mound of fries like F.O. but I can never complain about fries anyways. 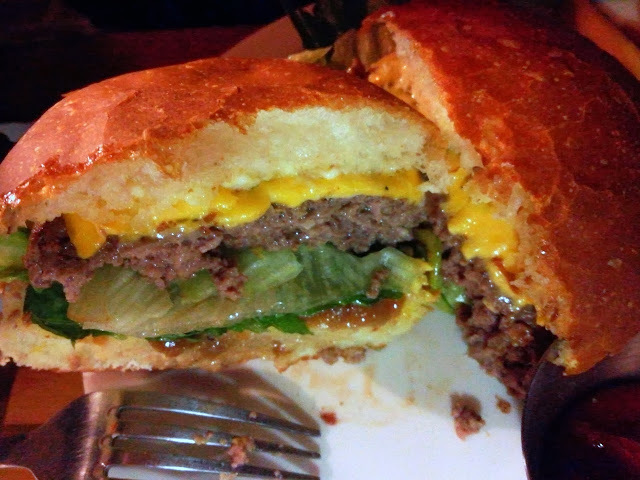 The burger was a decent size while the buns, as advertised, was clearly baked in-house. The bottom bun came with a slathering of onion relish and mustard, a bed of simple greens (not just iceberg lettuce), meat, cheddar cheese slice and some mayo on the top bun. Cutting into the burgers (to split), I was rather disappointed to see the patties were overcooked. A bit of pink in the middle is standard for burger joints but Mother's Office, perhaps in fear of off-putting potential Korean customers, had cooked it up to well done. As expected upon tasting, the meat was indeed overcooked as were the buns which, while I could clearly taste was fresh, was a bit dry and seemed more like it was oddly somewhere between a hamburger bun and a ciabatta. Buns and overcooked patty aside, the flavors were simple but tasty. The patty didn't have the overly sweet taste I've found in so many other burger places in Korea and simple spices like marjoram, thyme and such were detectable. The melted cheddar helped bring the flavors together and the onion relish on the bottom was fantastic and a nice touch to the whole thing. I also appreciated they didn't just stick some iceberg lettuce pieces on the bottom but included some other greens. ...it's overcooked to a well-done! When I first saw my "souvenirs de paris" burger, I initially went from being skeptic to regretful. 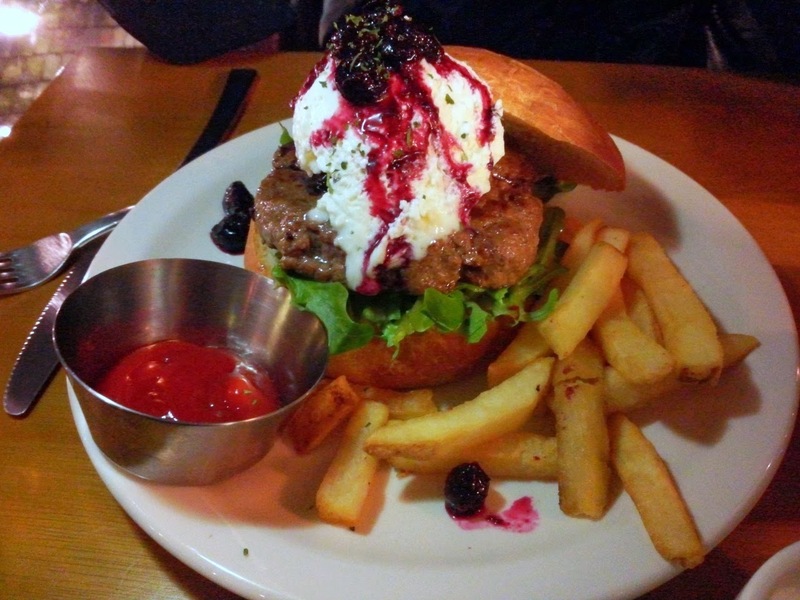 The open bun burger had a mound of heavy cream and blue cheese on top with blueberry compote drizzled over the whole thing and looking like someone in the kitchen had accidentally spilled an ice cream sundae on top of a burger. And blueberries? On a burger? I sighed as I rolled around a blueberry with a fork, imagining how the owner must have gleefully thought the addition of a currently popular "well-being" ingredient like blueberries would draw in the locals. 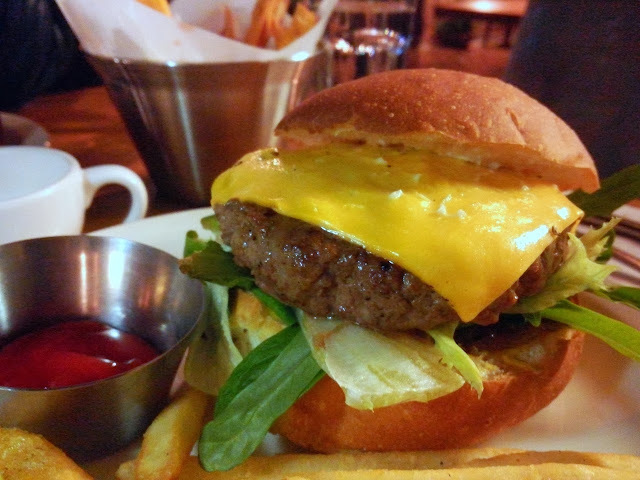 With no choice but to use a fork and knife for the burger (seriously, how is one supposed to pick up that thing?) I cut myself my first bite and tried it out. I expected the heavy cream to really overpower the beef but surprisingly it was lighter than it looked. The heavy cream had a slight tang to it from the blue cheese which, combined with the tangy-sweet taste of the blueberry compote, oddly went well with the savory beef. I've been to many burger joints in Korea where they take creative liberties to the extreme with their burgers with ingredients that don't work thrown together and often overpowering what should be the star taste of the beef patty. I'm still not sure how the souvenir de paris burger works entirely but it does and kudos to Mother's Office for taking a creative risk but actually making it work in their case. I suppose to give a comparison it would be as though one was to make a simple sauce out of Greek Yogurt, a few crumbled blue cheese and blueberry jam and spoon it on a grilled up burger. A bit tangy, a bit cheesy and sweet, the taste comes together in subtle ways which doesn't mask the flavors of the beef patty and complements it. Upon visiting this place and writing this review, I've actually found in my research that the Mother's Office in Noksapyeong is actually either a new branch of an original in Apgujeong or the place has moved entirely to this location. The Souvenir De Paris burger was also apparently one of the star menu items at its Apgujeong location. With same menu items, similar concept and environment as F.O., it's clear the owner at Mother's Office has decided imitation is the best form of flattery which is a bit disappointing ethically. Still, these things aren't limited only to Korea despite what some may think and even our Kiwi friends down south have been "influenced" by the star powers of F.O. Those issues aside, Mother's Office shows promise, especially through certain creative menu items and special details (onion relish, cheeses beyond cheddar, etc) which is not too common in the Korean dining scene. Still, Mother's Office fumbles in the basics in areas like the overcooked burger buns, sweet potato and (most importantly) the beef patty which holds it back from really being a real standout player among the competitive field. I appreciate the creative and whimsical chances Mother's Office takes, but perhaps they should be made after a few tweaks are made with their basics, especially with growing competition in the Itaewon/Noksapyeong area from other established and new burger joints on the scene. Bells, whistles and extra features on a car can only take it so far if the engine is just average, right? The place shows promise though, and I'm definitely down to stop by again and try some of their other menu items with some friends for a beer or two in the future. Mother's Office shows promise but needs to polish up its basics a little more to really be a standout. Tip: Mother's Office has a special lunch menu on weekdays in which you can choose between donkatsu or the Mother's Burger set for either 7,000 or 8,000 won (I can't recall which). The seats close to, or in the patio section has a vinyl, clear tarp covering which seems like it would be nice in the summer but is rather chilly on your legs in the winter time. I'd advise avoiding those seats if you're prone to the colder temperatures.